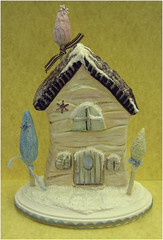 Here is the latest from the Cocoa Cottage series. I love making these. The cottage is a casting from my original sculpture. My husband makes a mold of my original and then he casts the reproduction out of a special mixture of clay and paper mache. The base is wood and the trees are wood sticks, wrapped in fabric that has been painted and glittered. The tops of the trees are out of paper clay. Each tree is adorned with a hand painted paper snowflake topped with a gem. I am currently working on some other cottages, who knows maybe a whole town. Take care and thanks for letting me share! Wonderful to "meet" you! Your cottage creation is charming and beautiful; I can't wait to see a village of them! Hi Kathy nice to meet you too! thanks for being the first to follow my blog. I truly appreciate it. This is a Flickr badge showing public photos and videos from Blooming Ideas. Make your own badge here. Well, I am a bit like a carnival ride... a little twisted, sometimes spinning in circles, always on the move, loud, joyful and theatrical. I love to be with my family and friends. I adore animals, and I delight in life. People fascinate me and I am humbled by the kindness of strangers. For the past several years I have made a living as an interior designer running my own design firm Mary Wadsworth Designs which specialized in children's room decor. My husband Guy recently joined my efforts when we launched our online boutique www.bloomingideasllc.com Where we sell our one of a kind redefined furniture pieces, light fixtures, wall art and paper mache sculptures. My favorite mediums to work in are paper mache, paper clay, fabric, paint and found objects.